If you have already read the Introduction (below) and want start reading articles, then decide whether to read HTML files in your web browser or else read PDF files in your Adobe Acrobat Reader (or equivalent). Click on one of the following two links to choose whether you want to use Method 1 (that uses frames) or Method 2 (that does not use frames). Method 1 is the preferred method in most cases. Method 1: Frames are used (recommended, except for low-resolution screens). Method 2: Frames are not used. Click on the following link to read PDF files in Adobe Acrobat Reader (or equivalent). Access the PDF Menu System. Beginning in the 1950s Dr. John D. Kraus was a Professor of Electrical Engineering at the Ohio State University and Director of the Ohio State University Radio Observatory (OSURO, later often known as the Big Ear Radio Observatory (BERO) because of the nickname of "Big Ear" given to the famous Kraus-type radio telescope designed, built, and operated by John Kraus). 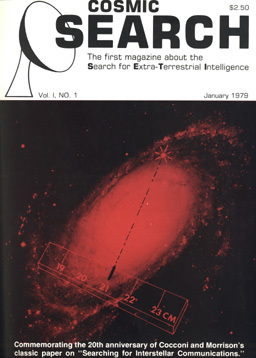 In 1977-78 Dr. Kraus saw the need for a magazine dealing with SETI (the Search for Extra-Terrestrial Intelligence). Hence, he established the organization Cosmic Quest, Inc. and supplied enough seed money to print just the first few issues of the magazine, which was named "Cosmic Search". The purpose of "Cosmic Search" was to "present all aspects of the search for intelligent life in space in a popular but responsible manner". 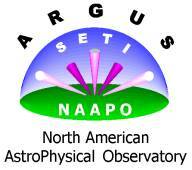 Over the years complete sets or individual issues have either been sold or else given away for a donation to our organization (North American AstroPhysical Observatory (NAAPO)). In 2004 we discovered that we had exhausted our supply of complete sets, so we have had to deny requests for complete sets. Thus, it was decided that we needed to convert the issues into an electronic form. Jerry Ehman volunteered to create the data files from scans of the 13 printed issues. Since he was doing all of the work to do the conversion to electronic form, it took him just over one year to complete that task. On September 2, 2006 it was decided by the NAAPO group of volunteers that the electronic version for the complete set of 13 issues should be placed on our "bigear" website (www.bigear.org). This website contains files for all contents within the original printed issues, with the exception of advertising. These files are of the types: (1) image files (JPEG and GIF files for images (i.e., photos, graphics, and illustrations)); (2) HTML files (HyperText Markup Language, i.e., web-browser-readable files); and (3) PDF files (Portable Document Format files, readable by the Adobe Acrobat Reader or equivalent). (1). Scan each page of each magazine, and save as a TIFF file. Pages with color were saved in color; pages without color were saved in gray scale. (2). For pages that contained photos, graphics, or illustrations, each one was cropped and saved as a TIFF file. Then either (and often both) small- and large-sized JPEGs or GIFs were produced from the TIFF file. In general, photos were saved as JPEGs while graphics and illustrations were saved as GIFs. Where possible, captions for photos, graphics and illustrations were included in the TIFFs, JPEGs and GIFs. (3). Each page that contained text was converted to electronic text using Optical Character Recognition (OCR) software, with the exception that OCRing was not used on advertising. (4). The OCRed text was reformatted to create appropriate word wrapping and paragraphs. An initial proofreading occurred during this process. (5). For each article the electronic text (from Step 4) plus any JPEGs and GIFs (from Step 2) was formatted into a webpage (i.e., using HTML). Occasionally, the formatting of the electronic version of an article needed to be adjusted from that of the printed magazine. However, the electronic version contains the entire text plus all photos, graphics, and illustrations found in the magazine. (6). A final proofreading of each article was done following its completion. (7). Using Adobe Acrobat Professional, the HTML files for each article were converted into PDF format. The quality of some of the photos is less than desired because of the following: (a) the quality of the paper used to in the magazine was less than desirable for the reproduction of photos in order to keep the cost of the magazine low; and (b) the original photos were not available to Jerry Ehman so that the only source to him of the photos were the scans made from the printed magazine. If a typographical error was found in any of the magazine articles, one of two things was done: (a) the error was corrected without comment; or (b) the error was noted in a red font often using the Latin word "sic" inside square brackets [ ] (note that "sic" means: so, or thus, and is usually written parenthetically to denote a word, phrase, passage, etc., which may appear strange or incorrect that has either been written intentionally or has been quoted verbatim). Jerry Ehman occasionally used explanatory comments written in a magenta font . These comments are not found in the magazine but are used to help the reader of the electronic version. Last modified: August 24, 2006. Note that the phrase "Designed by Jerry Ehman" simply means that Jerry Ehman did the conversion of the printed article from Cosmic Seearch magazine into the electronic version. He designed the format of the electronic version of the article on or before the date shown in the "Last modified" notation. As you read each article, please note that there are no original photographs or high-resolution images available for the photos, graphics, or illustrations (images) which appear in this electronic version (or in the original Cosmic Search magazines). As far as original photo credits are concerned, the only information we have at this point is the text (if any) which was printed next to each image (photo, graphic, or illustration). If a name other than ours (i.e., "Cosmic Search", or "Cosmic Quest, Inc.", or of a person working for that magazine or organization) appears, we cannot give reprint permission because Cosmic Search (Cosmic Quest, Inc.) was authorized to use these images but was not allowed to extend that authorization to others. Only the entity (person or organization) listed could grant the permission. If a photo was not credited, then there is no information available, and most likely no way to find out. If you wish to use one or more of these images in this electronic version, and if it appears that either: (1) no person or institution is identified for a given image, or (2) you are not able to make contact with the original owner of the image, then the only alternative is to take a chance that the original owner of the image will not object to its use. We are not able to take responsibility for your use of an image that has not received authorization from the original owner, since we cannot allow you to both (1) read the text and view the images, and (2) simultaneously prevent you from making a copy of either. Modern web browsers have the ability to adjust: (1) the size and placement of a window containing a document or the frames that contain a document, and (2) the size of the text (but probably not the size of an embedded photo or graphic). As a result, you have a great deal of flexibility in creating a viewing environment that is easy for you to use. Experiment with these settings. The same comments apply when using Adobe Acrobat Reader (or equivalent). Below are links to two methods for accessing the browser-readable HTML files. Each link will take you to an initial menu system, from which you will be linked to a file containing Enhanced Tables of Contents (EToCs). From the EToCs you may link to any article in any issue, arranged by order of either issue number or author. There is also an option to view one document containing all articles and miscellaneous items for an issue (of course, this is a large-size file). The first method is one that uses frames, and the second method avoids the use of frames. Several years ago most (all?) browsers implemented the use of frames. If you are using a very old browser, then you should choose the second method that avoids the use of frames. However, for most users it is recommended that you choose the first method that does use frames because it will be much more convenient to use. But note that if you are using a horizontal screen resolution below about 1024 pixels, the frames method will not provide enough screen width to view an article conveniently; hence, the non-frames method would be better in that case. Using Method 1 above (Frames Method), be sure to click in the frame at the upper left corner to start the viewing process. That frame contains an initial menu system with 5 tables plus an introductory list of symbols used in the 5 tables. Clicking on any of the 6 links takes you into the frame at the bottom left side that contains the complete menu system. Below is a link for accessing the PDF files. The link will take you to an initial menu system, from which you will be linked to a file containing Enhanced Tables of Contents (EToCs). From the EToCs you may link to any article in any issue, arranged by order of either issue number or author. There is also an option to view one document containing all articles and miscellaneous items for an issue (of course, this is a large-size file). For these PDF files, the initial menu system and the Enhanced Tables of Contents (EToCs) were created from the HTML Method 2 (non-frames method). Send E-mail to webmaster about Cosmic Search Magazine Online. Copyright © 1989-2006 Big Ear Radio Observatory, North American AstroPhysical Observatory (NAAPO), and Cosmic Quest, Inc.